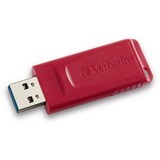 Compact and sleek design with capless retractable USB connector provides a stylish way to take your data with you. Ultra slim body is perfect for stacked USB ports. Password security feature available for download; feature only compatible with Windows operating system.